Vermonters from all across the state converged on the statehouse on May 1st in a demonstration to show that Vermont can be the first state in the nation to recognize healthcare as a human right, providing it as a public good by implementing a single-payer, universal healthcare system. Over a thousand people marched from the Montpelier City Hall down to the capital building accompanied by drums, dancers, puppets, baloons and signs supporting universal healthcare while chanting “hey, hey what do we say? Vermont is ready to lead the way!” The marchers then joined another two hundred participants already at the Statehouse lawn and swarmed up the capitol steps for a festive rally that featured skits by regional organizing committees of the “Healthcare Is A Human Right” campaign, musical performances by Vermont artists, and speeches by campaign leaders from all parts of the state. A group from southern Vermont performed a skit based on “The Wizard of Oz” that hit opponents of a single-payer health care system for using scare tactics. “Liars and tyrants and scares, oh my,” they chanted. The wicked witch represented a “greedy insurance company” and she melted after “single-payer water” was thrown on her. Sen. Sanders, a longtime advocate of universal care, called it a “moral disgrace” that the U.S. is the only industrialized country in the world that doesn’t guarantee health care for all of its people. I want you to pass a single-payer health care program in Vermont,” he said. “And when you do that, I will go to the president of the United States and say, ‘Mr. President, this is what Vermont has done. Let ’em go forward’.” To thunderous applause, Sanders added, “I’m going to go to my conservative friends in the Congress and say, ‘You believe in states’ rights. Well, here’s a state that has passed single-payer. Let ’em go forward!’” To operate a single-payer system Vermont would need a waiver to get out of the state insurance exchange required under the new federal health care law. Sanders said he and Sen. Ron Wyden are writing a bill that would allow states to become “laboratories for Democracy” and enact other health care models before 2017. A bill passed by both the Vermont House and Senate, and currently in conference to resolve differences, mandates designing three proposals for a universal health care system, including a single payer system. The rally Saturday was a celebration of the campaign’s accomplishments, an effort to strengthen the legislation, and another step in a multi year campaign to build the power to achieve a single payer system that fulfills human rights principles. 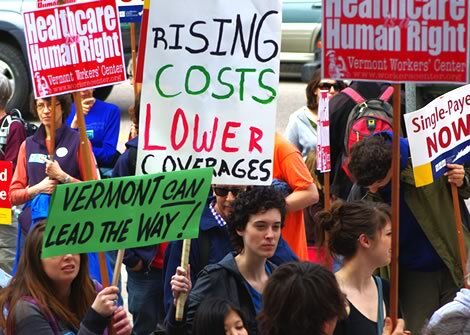 “We’re just gonna keep moving forward and hopefully by 2011, 2012 we can put in a real system that covers everybody, that makes sense, put our health care dollars toward health care services,” says James Haslam, lead organizer at the Vermont Workers’ Center.